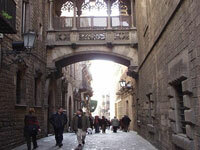 Known as the Gothic Quarter, the Barri Gòtic is Barcelona's oldest district. A former fortified Roman settlement, the maze of atmospheric narrow streets house spectacular Gothic buildings and cathedrals, marking the city's heyday during the 14th and 15th centuries. There are many significant sights to visit in this quarter, the most illustrious being the immense Gothic Cathedral La Seu, with its breathtaking façade and serene cloister. With an assortment of shops and delightful sidewalk cafés in a picturesque setting, the Barri Gòtic is a worthwhile day out. To view the remains of this ancient Roman city, once known as Barcino, visit the Museu d'Història de la Ciutat in the Palau Real, where Roman streets are still visible in the extensive cellar. There has been some controversy over the authenticity of the Gothic Quarter, as many of the district's most attractive features were actually added, in the Gothic style, in the last century, to promote tourism and restore the appeal of the area; however, it is a delightful district to explore and much of it is, or certainly feels, authentic. Most of the area is closed to regular traffic and largely pedestrianised, which adds to its charm, but taxis and some service vehicles are still allowed to traverse the quarter.